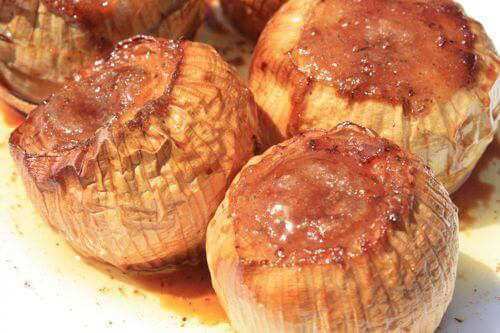 This recipe for grilled whole onions makes a tasty side dish that can be prepared for grilling in minutes, and cooked to a velvety texture as the main course finishes. Start out with a good quality onion. Vidalias from Georgia are great onions for the grill, and few Walla Wallas will work wonderfully too. If you can't find either, medium size white or yellow onions will do just fine. Buy four nice, medium to large size onions and some real butter. A little salt and pepper are the only other ingredients you'll need. Trim the root ends of the onions carefully...just take enough off to smooth up the bottom. Slice the top off of the onions, but leave on the dry skins. They'll protect the onions as they cook. 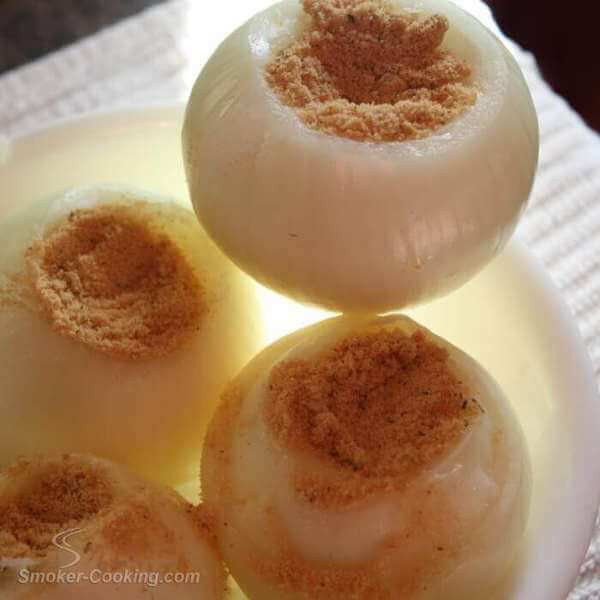 Very carefully, carve out a cavity in the center of the onion, without cutting through the bottom. If you cut through the bottom of the onion, it's ruined for grilling - all the butter will escape. Season the onions with a little salt, and a little pepper. Now, shove about a tablespoon of butter into the center of each onion. If there's room for more, push it in. These onions can't get enough butter! Optionally, skip the salt and pepper. Then fill the cavity with a pat of butter. Add a teaspoon of powdered chicken broth or beef broth. This gives the onions a really rich flavor! That's it for the pre-grilling preparation. Now it's off to the grill. Place the butter filled onions on a cookie sheet, and place the whole works into a medium hot grill, at about 300 degrees. Take care that they don't roll over during grilling. It would be a crying shame to lose all that buttery goodness. If an onion won't stay upright, stick a few water soaked toothpicks in its side and create a tripod support. Grill the onions for two hours, or until softened. Before serving, remove and discard the dried outer layer of the onions if necessary. Oh my, these are good! 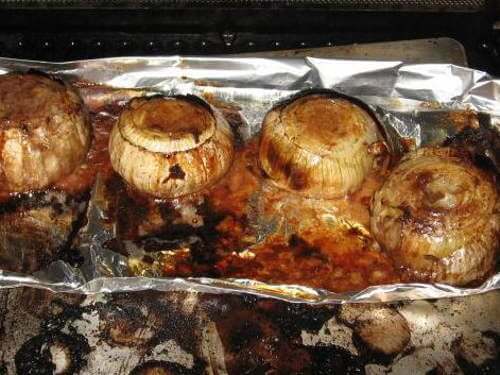 The last time I grilled whole onions, I decided to give 'em a bit more good flavor. After an hour or so of grilling on the cookie sheet, I moved the onions underneath a few rotisserie grilling Cornish game hens. Wow, did this ever make the onions tasty! Try it sometime. You won't be sorry.